Indianapolis, IN — Bills proposing the expansion of solar power have woven their way into the Indiana Legislature in a major way as the Republican-dominated Senate and House of Representatives begin their second month in session. Republicans have 40 of the 50 Senate seats to their name in Indiana and another 67 of the 100 House seats, which makes any bill backing solar or renewable energy a long shot. Moreover, as a part-time body which convenes for four months during odd-numbered years and two months on even-numbered ones, Hoosier state legislatures are hard-pressed to pass bills on any given year. That, however, hasn’t stopped a bipartisan collective of legislators in both chambers from introducing bills which would expand the use of solar power in the state. One of those bills — Senate Bill 430 — calls for a repeal of Senate Bill 309, a 2017 bill which cut back the use of net metering as a means of expanding rooftop solar power. The other bill, House Bill 1331, calls for a prohibition on homeowners associations (HOAs) making it difficult for property owners to place solar panels on their rooftops within HOA-governed housing developments. One of the co-sponsors of SB 430, Senator Ron Alting, was named one of three Conservative Clean Energy Champions by the non-profit group, Conservatives for a Clean Energy Future. So too was the sponsor of HB 1331, Republican Representative Mike Speedy, HB 1331 also has the support of two other Democrats, plus Republican Jerry Torr, who represents a district just north of Indianapolis in the suburb Carmel. Conservative Indiana may not be the first place thought of as part of the frontlines of renewable energy and climate change debate. This is the state, after all, which produced first Governor and now Vice President Mike Pence. But the new bills, one of which could soon advance to the full floor of the House of Representatives if it passes out of the Committee on Utilities, have forced a state more well known for refining heavy oil in Chicagoland and burning coal in its southern tier to host seemingly unlikely discussions on the issues. On February 4, Indiana Democratic Senator J.D. Ford hosted a press conference introducing SB 430, a bill which would bring back net-metering into Indiana. It would repeal a current law, SB 309, which came under contestation by environmental advocacy groups in the state when considered and eventually passed in 2017. Net-metering is a policy which allows property owners to utilize energy stored in excess during non-peak hours. Put simply, it allows for utilizing the power generated by the sun via solar panels, both during the day during peak sunshine, as well as at night when the sun goes down. The ratepayer sends solar energy generated from the sun via the rooftop panels back to the grid and that electricity generated comes off the final energy bill totals at the end of the month. In practice, this means less reliance on fossil fuel-based electricity generation companies, or the electric utility sector, for consumers. And it could eventually mean, with enough uptake, less reliance on fossil fuels at-large from the electricity grid. Proponents of net-metering also say that, due to the anti-monopoly and freedom of choice components undergirding the policy, it more naturally lends itself to bipartisan uptake in a red state like Indiana. In 2017, with major lobbying support from the electric utilities industry, the Republican-dominated legislature passed SB 309. The bill gradually phases out net-metering as a regulatory mechanism after a 15 year period, a move which has put a damper in the growth of the solar industry in Indiana and served as a jobs killer, too, say its detractors. Bills attempting to nix net-metering have received support at the national-level from the Edison Electric Institute (EEI), a trade association funded by electric utility companies and by extension, taxpayers who pay their electric bills. 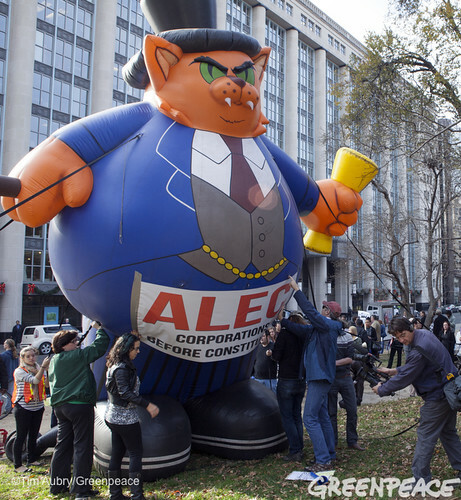 As a dues-paying member of the corporate-funded American Legislative Exchange Council (ALEC), EEI worked through the organization to get a model bill written by its lobbyists and then distributed to state legislators nationwide. One of those states which would eventually uptake the ALEC model bill was Indiana. 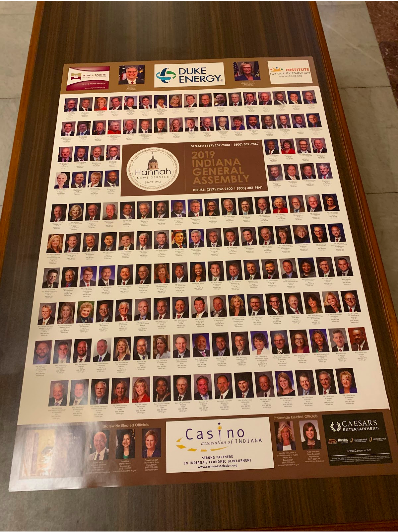 Within Indiana itself, SB 309 received lobbying and advocacy support from the Indiana Energy Association, whose members include — among others — coal industry giant Duke Energy. Duke’s imprint remains so strong within the Indiana Legislature that is official calendar is sponsored by the North Carolina-based industry hegemon. The company is also a member of EEI. In introducing his SB 309 corrective at a February 4 press conference held at the Indiana Statehouse, SB 430, Ford said that he hopes the legislation can receive support from both sides of the aisle and at least get a committee hearing. Indeed, the bill has co-sponsorship support of Republican Senator Alting, as well as two other Democrats. But even Ford acknowledges that the prospect of that happening during the 2019 session appears unlikely. Opening the arcane net-metering topic up for renewed dialogue in the state makes it a worthy effort nonetheless, though, he says. Net-metering aside, a bill with more prospects for success is another one centering around rooftop solar. That is, how the energy form interacts with Hoosier homeowners associations. For the third year in a row, Indiana lawmakers have introduced legislation in the form of HB 1331 calling for homeowners associations in the state not to restrict rooftop solar panels within their communities. Within Indiana, HOAs have full legal authority to craft contractual arrangements which de facto prohibit or nearly prohibit the ability to situate solar on the rooftops of their residents. Indeed, many states across the country have residential development by-laws mirroring those of Indiana. But HB 1331 seeks to undo that. The 2018 version of HB 1331, SB 207, passed in the Senate in a bipartisan fashion but failed to receive a House vote. The 2019 version of the law would not apply retrospectively to old HOA developments and only to prospectively ot new ones which crop up throughout the state. At a February 6 hearing in front of the House Committee on Utilities, Energy and Telecommunications, Speedy said modern technology has morphed rooftop solar panels into more sleek and less clunky-appearing entities. That clunkiness is often cited by HOAs when opposing rooftop solar within their communities. While arguably a positive in the column of combating climate change, Speedy and other Republicans seated at the hearing table did not mention that topic when voicing support for the legislation. Instead, consumer choice and property rights drove the conversation. Joey Myles, a constituent of Speedy’s who testified at the hearing and initially brought the issue to the representative’s attention, said he also methodically avoids mentioning climate change as it relates to the solar rooftop HOA issue in his attempt to drum up support for the bill. As a person living in an HOA neighborhood, he said he has taken a grassroots-driven approach in getting people in his community to support the cause. “If you’re gonna, talk to Republicans about…environmental issues, you have to make it about, you know, like Speedy was saying, about consumer choice and that…I should have the right to produce the energy on my own home,” said Myles in an interview after the hearing. Beyond Indiana, New Jersey, Idaho and Nebraska are currently considering proposals paralleling HB 1331. In 2017, Oregon and Utah passed such a bill, and so too did Minnesota in 2014, Illinois in 2011 and Washington in 2009. Florida, surprisingly way ahead of its time, voted in a similar law on the books in 1978, the Florida Solar Rights Act. Further, New York, Missouri, and Minnesota have also considered similar legislative proposals in recent years, too, which have yet to come to fruition. Carving out its own path, California has mandated that all homes built after 2020 must come equipped with rooftop solar panels. In total, 25 different states have laws on the books which limit the power of HOAs to restrict rooftop solar. During President Barack Obama’s first term in office, some congressional Democrats proposed a few iterations of the same pieces of legislation which would prohibit HOAs from making restrictions on rooftop solar, titling them the Solar Opportunity and Local Access Rights Act. According to federal lobbying disclosure records collated by the Center for Responsive Politics’ OpenSecrets.org, lobbying opponents of the federal bills included the likes of Duke Energy, the San Francisco-based PG&E and the San Diego-based Sempra Energy. The HOA bill has, compared to the net-metering bill which has the backing of the Sierra Club’s Hoosier Chapter, gotten little support from the traditional environmental advocacy community. Laura Arnold, president of the Indiana Distributed Energy Alliance, points out this has morphed into an asset for the bill’s prospects rather than a liability within a politically red state. 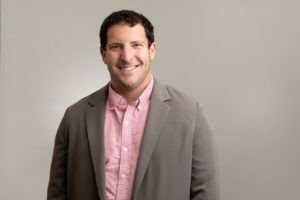 One of the bill’s backers is the recently-formed Indiana Conservative Alliance for Energy, which backs an “all of the above” approach to energy production in the state. The group’s executive director, long-time Republican Party political operative Tim Phelps, testified on behalf of the bill at the February 6 House Committee on Utilities hearing. The full House of Representatives has a February 25 voting deadline for consideration and voting on the bill. The Senate then would consider the bill and, if it passes, it would eventually need the signature of Republican Governor Eric Holcomb by April 29, the final day of the 2019 legislative session, to become state law.